Reduce wiring time by up to 25% and use less panel space with Secu Access. Secu Access (SAX) combines the accessibility of a test block with the variability of a terminal. It mounts on flat surfaces or on DIN-rail. Read more about Secu Access in the new product brochure, now available in our downloads section. SecuControl's family of products is continuously growing. On October 21-23, the new FTL switch will be presented for the first time at WPRC. SecuControl proudly presents Secu Access, a new terminal block with integrated test access point. Secu Access (SAX) mounts on DIN-rail or with screws, making it exceptionally versatile. Secu Access performs both functions of a terminal block and switch, and therefore reduces wiring and panel space needs. Application areas include relay testing, meter testing and current measurement. 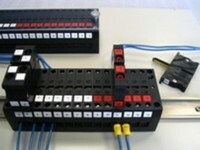 The modular terminal block attaches to many wire terminal types (ring / spade / solid wire). Just insert a testplug into the access point and start testing! Like the Interface Test System, SAX features a finger-safe front and keyed entry system. Current shorting testplugs provide additional user safety. With an internal resistance of only ca. 2mO, SAX is an ideal solution for the use with highly sensitive microprocessor relays. The SAX product brochure is available in our download section. At this year's WPRC Western Protective Relay Conference, SecuControl has demonstrated it's close cooperation with SEL (Schweitzer Engineering Laboratories). The further enhanced ITS system is patented in the United States now and experiences considerably increased customer demand. Order by November 15th 2006 for promotional pricing and delivery in December 2006. The SecuControl Test Case was developed to provide our customers with a solution for easy transport and storage of their test plugs and test accessories. The Test Case measures ca. 52 x 44 x 25 cm (ca. 20.5" x 17.3" x 9.84"), which is about the same size as the cases used to transport relay test sets. It is large enough to house an array of test equipment but small enough to easily store and maneuver in a substation. The case can be equipped with wheels for an additional cost. For this introductory offer we are providing the case with 3 x 19 pole test plugs, 3 x 14 pole test plugs, 1 x 7 pole test plugs and 1 additional two cutouts for other accessories (view picture above). All of the test plugs can be in any arrangement specified by the customer. Order by November 15th 2006 to be included in this promotional offer. SecuControl will bundle orders and deliver in December 2006. One Case for All Test Hardware Store & transport multiple test plugs and accessories in one test case. The SecuControl Test Case helps to insure that all pieces are accounted for when testing begins & ends and protects all hardware from the elements. Save Money In calculating the price for our promotional offer we have applied a discount to the total list price of included Test Plugs. Custom Foam Inserts Coming soon we will offer custom foam inserts based on customer specifications.